Before delving deep into the article and its topic let’s first take a small digression from the article and let us first travel almost a millennium back in time to an important juncture of Roman history in around 57 AD, when the infamous incident of the Druids massacre was committed by the Romans’. Where the entire priestly class of the native Celts, called the druids were massacred to pave way for imposing a self-acclaimed superior roman culture and religion. For years the Roman Empire was trying hard to conquer and subjugate the Celts, who inhabited what is today Great Britain. Although they had conquered large parts of the Celtic lands, yet they were unable to subjugate the native population guided and organised by the druid. Grown weary of the Druids, a Roman General by the name of Suetonius Paulinus organized and marched his legions for a final assault from his fortress town of Chester. The Roman General from his forward scouts had received information about a Druid gathering on the Island of Anglesey or Mona, which was considered a holy land by the Druids. The massacre that followed wiped out almost the entire druid population and followed by decimation of their sacred Oak groves, temples and anything that was supposedly sacred or important to the Druids and symbolic to the Celts by invading Roman legions. Proclaiming to be torchbearers of civilization, the Romans took it as their birthright to destroy and subjugate every religion or culture that was barbarian in accordance to their proclaimed definitions. The onslaughts carried out by the Romans and they likewise have occurred throughout the ages of Human civilization. Religions or civilizations that have considered themselves superior to others have repeatedly kept committing such acts of persecution on religions and civilization they perceived to be inferior. The moral superiority complex has given rise to elitism and this elitism had been in the core fuelling colonialism and invasions across the world in an attempt to establish their morality on others, there are plenty of examples available throughout human history to support this critical observation. India, famously known as ‘The Golden Bird’ remained a fascination for the world powers for millennia, from Alexander to Huns to Kushans all of them tried their might in an attempt to control and win over the Indian subcontinent. While all of these invaders later got absorbed in the society, the later invasions, mainly from Islamic invaders and Christian colonial powers inflicted the most damage on the native population and culture. While the previous volume of this very article had widely covered the various facets of Islamic onslaughts On India, this particular article will, in brief, discuss invasions and plundering caused by European powers armed with religion as a tool to justify the horrors and destruction they had committed on the popular culture of India. Though Christianity is believed to have existed in India from the beginning of the 1st century AD, the formal conquest of India had only started with Portuguese explorer Vasco da Gama discovering a sea route to India, arriving at the port of Calicut on 20th May 1498. Following the discovery of a formal route to India, other colonial powers like France, Holland, Denmark and Britain also joined the race of colonising and looting the Indian subcontinent. The deceit and plundering that these colonial powers executed on the native population left the Indian subcontinent socio-economically paralysed for centuries. 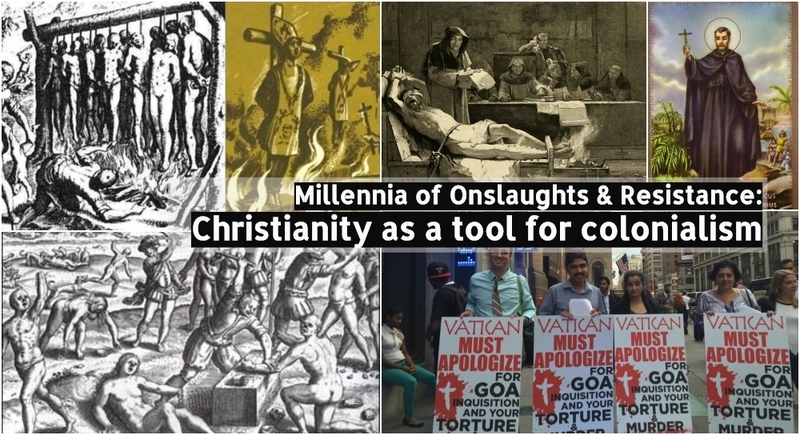 The trickeries that these colonial powers used to conquer India are well documented in history, with increasing influence of colonial powers; persecution of the Native culture also became widespread and most horrific of them being the infamous Goa Inquisition. As a pioneer of discovering the eastern horizons, Vatican pope empowered the Portuguese with Padroado Rights or spiritual patronage to evangelize and establish Christian clergy in the newly Acquired territories. This also ensured exclusive rights of Portugal in their easternmost territories in India. What first started as spiritual patronage by the pope, later paved way for a more brutal form of proselytization on the natives in the name of Inquisition. Prior to formally establishing an inquisition office in Goa to rigorously enforce Christianity, the territories under the Portuguese colonial rule already started feeling the brunt of evangelical activities. On 8th March 1546, the then king of Portugal, King Joao III gave an order to forbid Hinduism and all forms of Hindu practices within the conquered territories of Goa. He also ordered the seizure of all the properties of Hindu temples and transfer of these seized properties to Catholic missions in Goa, which followed a hefty tax on Hindus and expulsion of Hindu priests from the occupied territories. Even after enacting such severe anti-Hindu laws, the colonial dream failed to achieve its target of exterminating Hinduism. 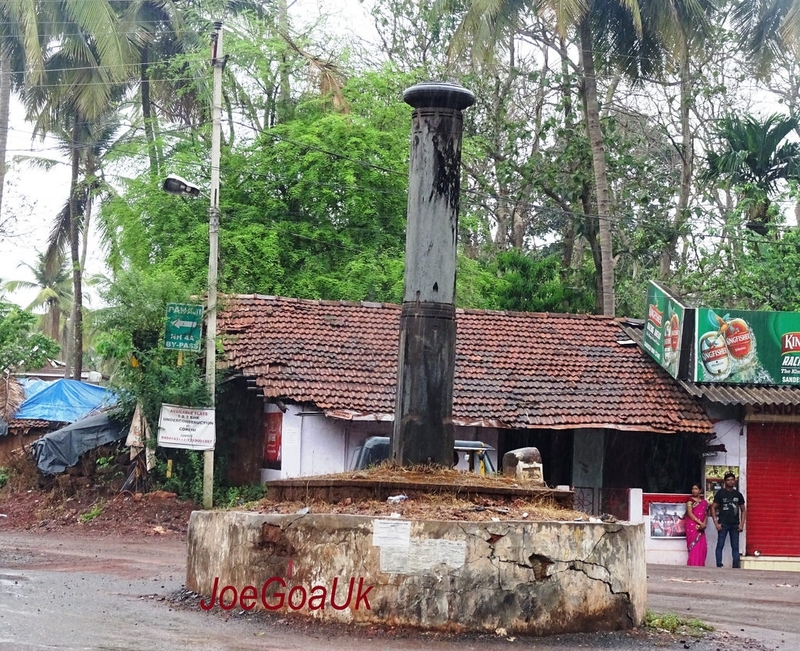 The 'haath kataro' pillar in old Goa, used by Christian inquisitors to tie Hindus to burn them alive and to hang the cut hands of helpless Hindus. ● Forbidding individuals of the Hindu community from holding any public offices and reserving them only for Catholics. ● Hindus were forbidden from carrying, producing and possessing any idols or sacred symbols. If anything of such kind was found in the possessions of the Hindus, they were subjected to severe punishments. ● A state-wide ban of Hindu religious texts, Sanskrit, including a ban on speaking Konkani and other Indian languages. ● In a royal order passed by the Portuguese monarchy, what can be termed equivalent to forced conversion, it was made compulsory to hand over the children’s of Hindu families whose father had died to the Jesuits for conversion and indoctrination into Catholicism. The discrepancies of the order were such that, even if the mother was still alive, children were forcefully snatched away and converted. The impact of this order was such that families in fear of losing their young ones had to accept Christianity or otherwise had to pay a hefty bribe or other illicit favours. ● The inquisitors also made a law that if any Hindu women would convert to Christianity, then by law she would inherit the entire property of their parents. ● No Hindu was allowed to be a member of the village council or a village chieftain except the Catholics. ● Hindu families were prohibited from attending village assemblies. ● Hindus were not accepted as witnesses on any legal matters. ● All Hindu temples were demolished in Portuguese Goa, and Hindus were forbidden from building new temples or from repairing old ones. A temple demolition squad of Jesuits were formed who actively demolished almost all temples, accounts of which could be found describing that all Hindu temples in the Portuguese colony of India have been demolished and burnt down. ● Ousting the brahmins and demeaning them in the society was one of the major tasks that Jesuits pursued. For they believed that without the Brahmins to perform religious ceremonies of birth, marriage and death, Hinduism would die a natural death. ● Every Hindu religious festival was banned. Though these are only some of the restrictions to name, the inquisitors did everything in their power to destroy and exterminate every essence of the native culture. 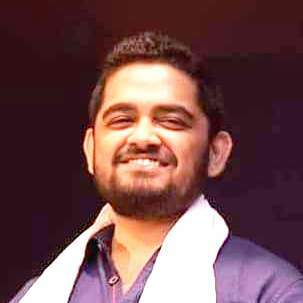 The major motto behind all this was to make the life of every Hindu and non-christian so hard that they would have no other option but to accept their version of worldview, which according to them was merciful and just. The colonial powers always promoted Christianity in their colonies with all their might as it suited their agenda of establishing permanent control over the masses and they saw Christianity as a tool to control the masses once they were converted, for as long as indigenous faiths and culture would have survived the colonial establishment would always be perceived as invaders. A nearly four centuries of Portuguese rule ensured the destruction of thousands of indigenous religious institutions and persecution at the hand of these imperialists. Though the records of persecution committed by the palace of inquisitions were later burnt, yet it is estimated that around eighteen to twenty thousand people were tried by the Catholics in the name of Inquisition. Their choice of words as idolaters, heretics etc for the Hindus, empowered them with the necessary moral superiority to abuse Hindus and other non-Christians. Though for almost four centuries, the Portuguese continued their pillaging and loot, yet they failed to kill the longing by the masses for preserving their native cultures. Despite such hard measures to discourage and destroy the Hindu way of life, it prevailed among the masses and the inherent oneness was preserved and passed down throughout the generations until Goa was finally liberated to be one with the motherland. The demand for independence of Goa and merger with India started catching momentum with the abolition of Portuguese monarchy in 1910 and took a significant precedence with rest of India securing independence from the British colonial rule in 1947. The Rashtriya Swayamsevak Sangh played a pivotal role in revitalising the call for Independence and finally on 19th December 1960, the Indian Government made its armed intervention, liberating goa and making it one with India again. Every colonial power from the Portuguese, French, Dutch to the British acted on the principles of three ‘C’ which can be summarised as, Colonialism, Christianity and commerce. In their own notion of a civilized society, one true God and one holy book, they acted on the lines of fascism. The level of fascism prevalent among these Christian colonial powers can be understood well from the famous poem written by Rudyard Kipling named, the “white man's burden” in 1899. Where he argued about the necessity of white man’s imperialism to civilize the savages of their colonies. Providing a comfortable guilt-free explanation, Rudyard Kipling armed the colonial powers with a necessary phrase to justify their economic and religious exploits with a pseudo-moral obligation. "I have travelled across the length and breadth of India and I have not seen one person who is a beggar, who is a thief. Such wealth I have seen in this country, such high moral values, people of such calibre, that I do not think we would ever conquer this country, unless we break the very backbone of this nation, which is her spiritual and cultural heritage, and, therefore, I propose that we replace her old and ancient education system, her culture, for if the Indians think that all that is foreign and English is good and greater than their own, they will lose their self-esteem, their native self-culture and they will become what we want them, a truly dominated nation."